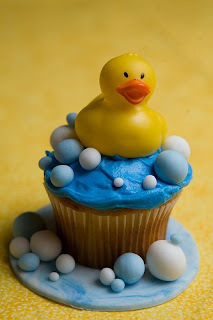 Fizzy Party: Rubber Ducky Day!!! CUTENESS alert! Of course this little cupcake was found on...where else...Cutest Foods! 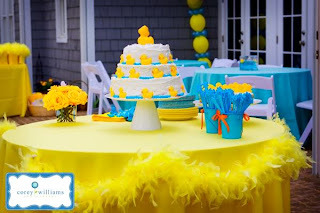 These center pieces are oh so adorable. Never too old for a rubbery ducky party. As seen on Hostess with the Mostess. 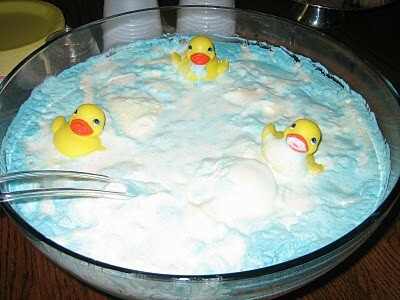 Every party needs a signature drink and this one from Seeking Delightful Pleasures is perfect for Rubber Ducky Day. 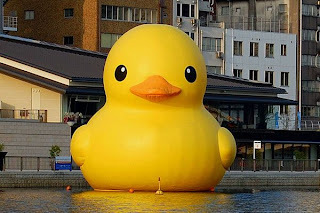 I think Rubber Ducky day needs to coincide with Bubble Bath day. Perfect! Now go take a bath. Cool duckie! Realy thanks for starting this up. This web site is one thing that is needed on the net, somebody with a bit originality. Helpful job for bringing something new to the internet! Oh my goodness Victoria thank you SO much! :) I hope to continue to bring fun and originality! Stay tuned for more great interesting day ideas. I don't know what to say! It's amazing, all the details are just great. Thanks so much for sharing!